I started David Nichol's One Day during my reading slump last week - I had recently read a good bit about it on the Dewey Divas blog and figured I might as well give it a try. Lucky me! It did the trick. 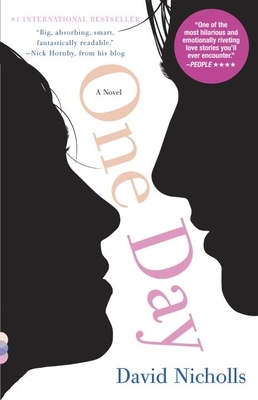 One Day is, in brief, the story of two college friends - Emma and Dexter - and the ways their lives continue to overlap through the years. With some of the most epic bad timing I've seen in characters recently, they continually need each other, miss each other, find each other, love each other and lose each other in a veritable plethora of combinations. The premise sounds simple, and rather chick-lit-esque, at that, but I assure you, it is far from it. * Nichols' story is heartbreaking, touching and important in every way. The genius of Nichols' writing lies in his presentation: each chapter is July 15th - St. Swithin's Day, apparently - of a proceeding year. And so the reader is told the story of Dex and Em, Em and Dex in snapshots of one day over the years. The title, therefore, is fitting, both because of this unique writing style and for other reasons that I won't explore here in fear of spoilers. The initial buzz for the book - first released in the UK (it's a British book,** so be prepared for British spellings and the like) - calls the book "roaringly funny" (The Guardian) and "funny" (The Times). I couldn't disagree more, but maybe that's a difference in British vs American humor (humour?). I would, however, agree that it is "heartbreaking" (Tony Parsons) and "wise... perceptive, compassionate and often unbearably sad." (The Times again). Bottom line: The lack of (understandable) humor and substantial amount of heavy subject matter is in no way a detraction from the value of the book. Nichols has crafted a poignant, lingering story of love, friendship and life in his unique novel. One Day would qualify (to me, at least) as ideal beach reading, perfect distraction, easy to put down and pick up again, and yet substantial, satisfying, and not a throwaway of time and energy. Highly recommend. * Note to marketing personnel: You need to work on the back cover copy for the ARC. The copy floating around the internet on Amazon and Indiebound is better, at least, but the back cover blurb I read before picking this up almost convinced me not to read it. ** Originally published in England, the book is out in the US (as a Vintage Paperback) this month. Note: I received a review copy of this title from Random House when at the offices for a sales meeting. This is a good book and it is funny (poignant) rather than funny (haha). A lot of the humour is that of recognition and some is related to the very 'englishness' of the situations. A great read. I thought this was bloody awful, but maybe I was more in tune with the English references. Read my full blown rant here: http://guiltyfeat.com/2010/07/10/one-day/ I'd love your feedback. Cheers.